In full disclosure I must admit up front that this is one of my favorite Russian Imperial Stouts. Even my “Better Half” Kathy likes the chocolate aftertaste in this beer. I was very excited to see it so early in the store, this beer was not released until November last year and then you couldn’t find it after Christmas. 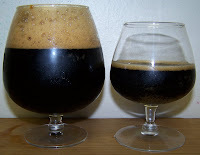 Pours a dark brown/black, stout black, totally opaque with a very rich and creamy tan head, mostly creamy with a few soapy bubbles mixed in. Rich roasted malts on the nose, sweet and almost smoky, notes of coffee and chocolate a slight hop presence and just the hint of dryness, alcohol I suspect. Wow, if I used a word like Luscious to describe a German doppelbock I don’t know what I’m going to use to describe this succulent beverage. This is almost beyond words, well at least beyond my vocabulary. This is another one of those beers that’s one continuously building experience of pleasure climatically finishing with a smooth rich sweet and creamy mouthfeel then exquisitely chocolate finishing notes in the aftertaste. There is also the most pleasant warming feeling following the taste as you feel not taste the alcohol warming your chest with every sip. This has got to be on of, if not the smoothest, Russian Imperial Stout I’ve ever had. The warming effect of this beer just makes you melt, let out a long sigh, sink back into your seat and bask in the comfort of this brew. For me it’s like being reunited with a long lost friend that I haven’t seen since last winter. 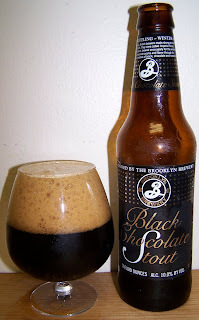 The world just turns a little slower when drinking a Brooklyn Black Chocolate Stout. We are now at 70 decrees and it’s even smoother and more flavorful then it was when it was cold. The head has completely disappeared. There is not lacing per se but this beer is so rich and creamy the beer itself is clinging to the glass. This is a true Comfort Beer; something that can soothe and warm you without a fire. Just set back, relax and enjoy the experience. One Phenomenal Brew a Solid A+ assuming I don’t create an O for outstanding letter grade. And I even shared a snifter with my Better Half. This is Mark from Video Beer reviews. I decided to check out your blog and find that you've reviewed a beer I just got last week. I really like stouts and this one sounds great. I'm with you that these type of beers should be consumed at warmer temperatures, the flavors just seem to open up. I should be doing my review of it at some point in the near future. Keep up the good work of spreading the love of good beer! I'll add your blog to the "links" section of my blog. Thanks for the kind words and welcome to my beer insanity. Now that you are here please don’t be a stranger I could use your constructive criticism and comments. As you can see I’ve been using your phrase of “Stout Black” to describe the color of some of these stouts. It will be nice to share comments on our reviews. I’ll be looking for your review on this and others.